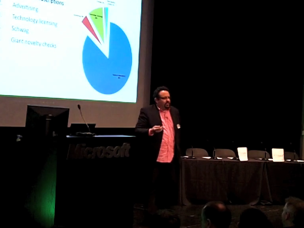 Last week at the Founder Showcase, a quarterly event put on by Adeo Ressi’s TheFunded, Evernote CEO Phil Libin gave a presentation discussing some of the startup’s key revenue numbers and strategy. During his talk, Libin outlined some of the ingredients in making the freemium model work, and how long-term users actually become more valuable over time. Sometimes people say “The best product doesn’t always win”, and are implying that you should focus on other areas, like marketing. In the Internet age, a good product can get the rest of that stuff (marketing, etc.) for free. So focus on that. And then charge for it. A year ago Evernote was making most of its money from licensing its technology, but it focused on its premium plans ($5/month or $45/year) because that was more scalable. Now, premium subscriptions bring in around $300-400k a month, and licensing represents around $45k. Evernote has 3.1 million cumulative users, and adds around 10k a day. Around 68k paying customers. Users have grown more valuable over time. New users convert to premium at a rate of .5%. But of the users that signed up two years ago and are still active, 20% have become paid customers. This trend is important — most users quit quickly. But the ones that stay become much more likely to pay over time. Evernote’s cost per user is around 9 cents per active user per month. It makes around 25 cents per user per month. The site reached break even a year and a half ago. We should note that Libin has previously discussed similar information, though the video provides more detail.